Walking through the austere building, you hear hushed voices, feel a cool draft and see stark white walls everywhere you look. You move from room to room glancing at each of the hundreds of paintings, prints and sculptures that break up the bright white nothingness with mild interest. A friend dragged you to the Grand Rapids Art Museum. 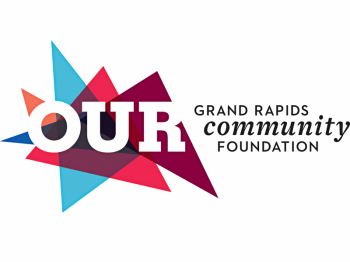 Perhaps instead, it is theFrederik Meijer Gardens or the annual art fair in East Grand Rapids you are walking through with a lack of interest . Maybe you do like art but just don’t know what to make of it most of the time. Everyone experiences art at some point in their lives. With these pointers, your art viewing experiences will surely go from feeling lost and confused to feeling rewarded, perhaps even profound. If you really want to experience the art, analyze some basic formal elements. Are the colors bright or muted? Why might the artist have used these colors specifically? What kind of shapes do you see within the work? Do the objects in the work form any shapes? Also, look at the lines that are created by the shapes and brushstrokes within the work. Are they curvilinear and organic or straight and crisp? 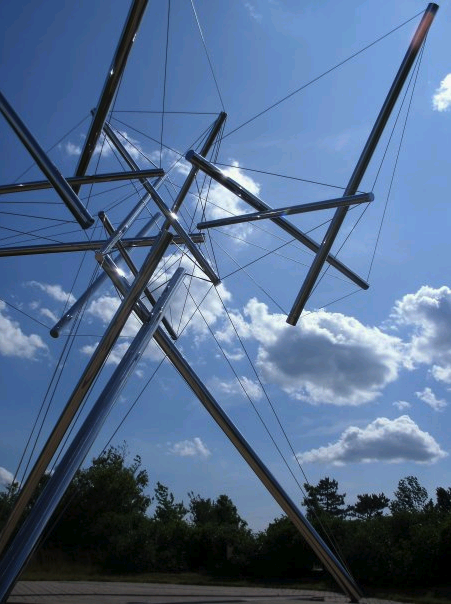 For example, Kenneth Snelson’s work entitled B Tree II at Frederik Meijer Gardens is very geometric. The lines that the artist uses to create the shapes are very straight and crisp. How does the line affect the meaning of the work? A good tip from the Curator of Arts Education at Fredrik Meijer Gardens is to “take your finger and follow the lines and shapes in the artwork (sketch in the air)” (Holst 2009). Yes, you may have the basic ability to create some of the contemporary pieces of work that are out there, but you didn’t. Respect that the artist took time and thought to put these pieces together. Instead of tearing the piece apart, try to figure out why they did what they did. What is the meaning of the piece? Why might the artist make the subject abstract rather than realistic? How was it made? Was it cast in bronze, formed with found objects or molded out of clay? 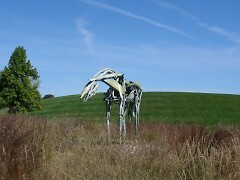 For example, Deborah Butterfield’s sculpture found at Frederik Meijer Gardens entitled Cabin Creek looks like it was made from drift-wood. The model for the piece was made from drift-wood, but the final piece was cast into bronze and a patina was added to make it look like wood. Look at the piece from several different angles. Some works are meant to be seen from an extreme angle. Take, for example, Hans Holbein’s work, The Ambassadors on display at the National Gallery in London. An image of a skull is skewed to the extreme. Without standing to the far right, you would not be able to see it. Looked at from a different angle, a work might mean something entirely different to you. Similarly, look close and look from afar. Bring a pencil and a small notepad. Jot down the artist, the title, and the date of the pieces that you are interested in. Write down what drew your attention to the piece. That way, you will be able to look up more information on them or just have a memory jogger for later to recall a piece that you liked. Don’t just look at the famous pieces. The most famous works of art are generally famous for a good reason and indeed, you should take the time to look at them. However, don’t pass the other pieces by. Hidden gems are embedded within the corners of museums. Something that may not make sense right away can become clear with a little time and thought. My art history professor used to say that the average viewing time for art is three seconds per work. That is hardly enough time to get anything out of the experience. Soak it in. What is the artist trying to say? What does the piece mean to you? Take your time and contemplate these things. Although it can be extremely tempting, remember not to touch. As the website for the Frye Museum reminds us, “paintings and other works of art are fragile and the natural oils on your skin could damage the surface” (Frye, 2009). For a similar reason, many museums do not allow pens in for the safety of the artwork. If a paper is drawn on over a piece of art with a pen, it can leave permanent damage. Of course, you should not draw on a paper over any art. Still, bring a pencil. It is easy to be a shutter bug and just pay attention to the works that are famous. If you really like the piece, get a postcard from the shop. They are cheap and will likely be a better picture than your camera can take anyway. Instead of snapping away with the camera, take the time to experience the art. If you must bring your camera, ask if photographs are even allowed. Most importantly, if you do take pictures of art, I implore you please, turn your flash off! The flash of the camera is damaging to the finish of art. It will change the color just as colors on paper will fade in the sun. Easily found on the Metropolitan Musem of Art's website, it states, “Flash photography and video cameras cannot be used inside the Museum”(MET, 2009). This no-flash policy is one that many museums enact. Complying with this rule and the last ensures that the art will be there for you to enjoy tomorrow and for your children after that. Following at least some of these simple steps, your focus will no longer be on the whispered voices, the cool draft or the too white walls. Instead, your thoughts will be on the profound experience that can be obtained from having a personal moment with a really good work of art. Holst, Heidi. (2009, November 8). Personal interview.